A lecture on the life, philosophy and works of Iamblichus. Iamblichus (c 245-325 CE) played an important role in the development of late Platonism (or what is sometimes called neoplatonism). Like his contemporary Plotinus, Iamblichus revisited the writings of Plato in order to bring into a more open light, the subtleties of the dialogues around which the Platonic tradition is woven. 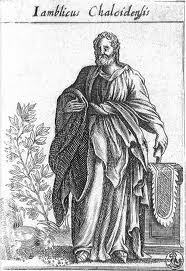 Iamblichus brought a profound understanding of Oriental wisdom to the Greek tradition, as indicated by his most famous extant work – On the Mysteries of the Egyptians, Chaldeans and Assyrians. Overarching all his writings and teachings is the affirmation that philosophy is a divine work which draws the human towards a godlike form, enabling us to play our role in a divine Cosmos. The fourth in a series of lectures, "Six Lectures on the Philosophers of the Platonic Tradition"